Canefield's Urban Council (CUC) wanted a truck. They got it on Friday. The municipality, situated just northwest of Roseau, the capital, wanted a new council as well, and on Friday, Maximin Powell took the seat that Simeon Albert had held for the past 15 years, a period often marked by bitter disagreement among members of the council. "Remember you are placed here by the people, for the people," admonished Coletta Felix, the District Development Assistant,as she addressed the inaugural meeting of the 24-year old council at the Old Mill Cultural Centre. "Agree to disagree," she said. Before Powell took his new seat, Albert said a lengthy farewell to the council in a speech in which he presented a detailed outline of his achievements, including obtaining the sought-after truck that was obviously a gift in the pipeline as Powell and his group campaigned to unseat Albert. During his five-term stint as CUC chairman, Albert said his council built roads, created new communities, established water supplies and erected street lights and playing facilities. But residents and some members of the council wanted him to leave, apparently because of his close affiliation to the ruling Dominica Labour Party. "And you had senior businessmen in the municipality who owned business here who publicly said they would not pay their taxes unless Simeon Albert is no longer the chairman," Albert said. 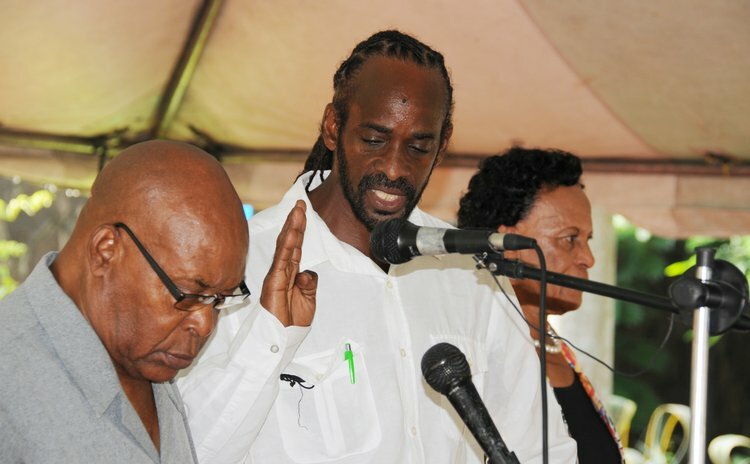 Albert did not contest the CUC election held on 12 September 2016 and the Government of Dominica did not nominate him to the council either. "It was never my intention to come through the backdoor, since I always like coming in through the front," Albert said. Residents of Canefield apparently did not take the election seriously. Only 303 of the 2145 registered members of the Canefield community voted in the election. Abstentions numbered 1842 or 85.87 %. "There is a need to stimulate more interest in the council and Local Government since the turn-out was only 14.13% as compared to the turnout for the general election for the area was 56.07 percent," said the Chief Elections Officer in a report on the CUC elections. "There was a turnout of 14% during the elections which indicates that the people have lost confidence or (is) losing confidence in the council," observed DDA Felix. The other elected members of the new council, (who contested the election as a team in a successful attempt at negating government's influence in determining the CUC chairman) are: Ingrid Abraham, Michael Coipel, Joyce Dupuis and Michael Timothy. The nominated members are: Franklyn Fabien, Veronica Graham and Alleyne Wilson. It appears that Powell recognizes that his group needs the cooperation of the nominated members of the CUC, as well as the goodwill of residents, if his plans are to materialize. "As of today we are a team of eight councilors who are ready to serve you, the residents of Canefield," Powell said in his first public address as chairman of the CUC. "Our goal is to turn Canefield into a model community". Powell added that his council plans to improve roads, rehabilitate the Eddie Toulon Park, revive Canefest, review disaster mitigation plans and improve solid waste management. And the CUC wants a truck. Almost magically, Rayburn Blackmore, the Parliamentary Representative, told the CUC that the truck was here and it was their own. "I know you have been asking for a truck… I want to say to you by next week Friday that truck will be handed over to the Canefield Urban Council," Blackmore said. But at the same time, Blackmore said he would like to remind the CUC that it is an auxiliary of government, under the control of the minister of community development. "The only difference is that it (the CUC) operates from a community or local level," he said.